is a web based file transfer software built for people that need transfer file pc to pc regularly. It features in ease of use, speed, reliability, and security. DVDFab File Transfer for Mac is a handy and convenient file transfer program to transfer the converted files on your Mac to devices such as iPod or PSP with fast speed. Besides, you are free to set the order of the converted files with it. SnapTalk is the cross-platform private chat and file transfer utility for your office. It uses peer-to-peer technology and runs independently from public chat systems for completely private messaging. Seamlessly connects Mac and Windows computers! 4Videosoft iPhone Transfer is the professional iPhone file transfer software to transfer iPhone files, including music, movie, Pictures, Camera Roll, Ringtone, Camera shot files to computer and to transfer computer video, audio, image, etc to iPhone. FTP/SSL for .NET is a versatile File-Transfer component for .NET languages (such as C# or VB.NET). It allows you to Transfer files directly from your application using FTPS, an extension of FTP which is fast becoming a standard for secure FTP. This protocol is also known as FTP over SSL or FTP over TLS. Secure file transfer automation and synchronization with support for FTP, SFTP and FTPS. Other features include email notification, task scheduling, command line secure ftp, file (de)compression, transfer status monitoring, and OpenPGP Encryption. Fast, robust, easy to use SSH server for Windows with secure TCP/IP tunneling; SFTP and SCP file transfer; VT100/xterm; Windows group, domain account support; public key and Kerberos authentication; virtual accounts; powerful configuration. 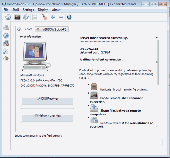 Link Maven is a parallel link file transfer tool for Windows 95 - Vista. Connect two PCs together with a Laplink/Interlnk compatible cable and copy, move, & delete files and directories between them. Also connects to DOS/Win 3.1 PCs. FireFTP is a powerful FTP client that makes downloading mp3 music, movies and software easy by combining an easy to use interface with a versatile multi-threaded file transfer engine.